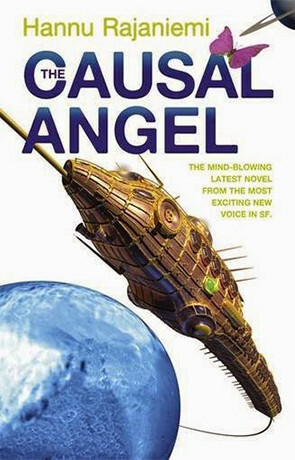 The concluding part to the adventures of Jean Le Flambeur, The Causal Angel is a little confusing in its listing on various websites. Despite some titles to the contrary it is part three of the trilogy; where The Fractal Prince is part two and The Quantum Thief is part one. Admirers of Rajaniemi will know what to expect from this conclusion in terms of the writing. In this we have more of the same blend of William Gibson, Harry Harrison and Charles Stross, to name only a few. The conceptual nature of the text is difficult to grasp for those trying to visualise it and the reading experience becomes more manageable when you step back a bit, letting the flow of pseudo-science language wash over you. Once again, as was done with The Quantum Thief, Rajaniemi reverses the exposition moment, only providing all the details of the solve and how it might be accomplished towards the end of the novel. However in The Causal Angel we know most of what is required as we’ve been party to Jean Le Flambeur’s previous adventures. The characters remain the strength of these stories. The death of one in particular in this third part does feel functional and others re-appear despite their stories being complete in the previous books. However, these cameos do not detract from the arcs of Flambeur, Mieli and Josephine. Flambeur is reminiscent of Harrison’s Slippery Jim diGritz, but transacts on levels the rat and its creator could never have imagined. There are tantalising glimpses into the origin of Rajaniemi’s strange future and more indications of how the virtual world integrated itself with the real world when it was first envisioned by his ‘founders’. However, the compression and expansion of time, distance, ability and more throughout the series has always left me unable to comprehend how things work. By comparison, Stross’ Saturn’s Children gradually becomes clear in the image of its scenes. Rajaniemi’s work does not, mostly owing to the vast array of concepts on show in every sentence. At times you do entirely get it, but when there is conflict, you usually don’t. The trick is (as mentioned) to lie back and float, admiring the construction and following the characters to their conclusions. There are some clever workings of plot in this, with the Dilemma Prison introduced at the beginning of the first book proving to be a pivotal part of the scheme at its end, its significance hidden in plain sight. Modern science theory references are scattered throughout like confetti, making the Heisenberg compensator pale by comparison. There are other familiarities reintroduced for different reasons and with each the reader can compare how far the story has moved and changed since they were last there. Rajaniemi’s trilogy is worthy of reading and admiring for the way in which he has created a future reality that is difficult for us to imagine, precisely because it is likely such a far flung future would be difficult for us to comprehend and understand. The Jean Le Flambeur story is not one that could work in other genres without significant changes to its elements, although you can clearly see influences drawn from outside of science fiction at times. The gist might be workable as a western, a fantasy or something else, but it would wholly lose the elements which you marvel and struggle the most with, the setting and scope of what is being attempted, which is certainly, mind expanding. Written on 2nd September 2015 by Allen Stroud.